Tougher sanctions against Russia could destabilize the country and provoke an “even more dangerous” situation in Europe and have negative consequences for the entire world, German Vice-Chancellor Economic Affairs and Energy Minister has warned. 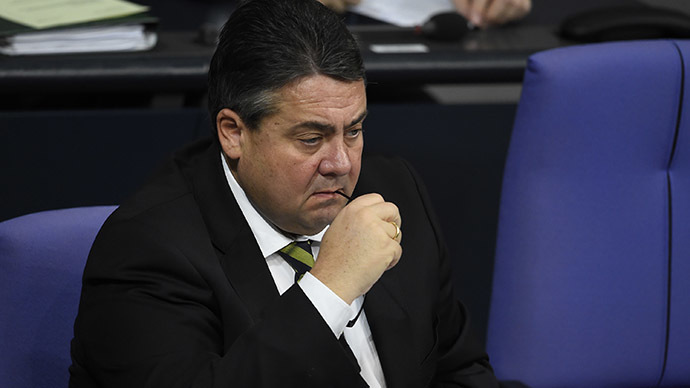 "Those who want it, provoke an even more dangerous situation for all of us in Europe," Sigmar Gabriel said in an interview with the Bild am Sonntag newspaper on Sunday. "Those who are seeking to even more destabilize Russia from the economic and political point of view are pursuing quite different goals." The goal of sanctions against Russia was to return Moscow to the negotiating table to find ways for a peaceful resolution to the crisis in Ukraine, he said. He elaborated that additional sanctions may exclude Moscow from partnership in the resolution of conflicts which “will have very dangerous consequences for the entire world." Though there are some in the US and EU that "would like to floor their superpower rival,” but it is not in the interest of Germany or Europe, he stated. "We want to help solve the conflict in Ukraine, not to force Russia to its knees," he stressed. The US and EU slapped Russia with several rounds of sanctions, starting in March after Crimea joined Russia. Western nations have accused Russia of annexing Crimea, though Moscow has denied the claims stressing that residents of the peninsula voted in favor of the notion in a referendum that was in line with the international law and the UN Charter. The first round of Western sanctions targeted Russian officials and companies and included visa bans and asset freezes. The second round of sanctions that put pressure on financial, energy, and defense sectors was announced in July with the US and EU blaming Moscow for involvement in the unrest in eastern Ukraine. Moscow has denied the claims. Following Western restrictions, Russia imposed a one-year ban on imports of beef, pork, poultry, fish, cheeses, fruit, vegetables and dairy products from Australia, Canada, the European Union, the US and Norway in August. France’s largest farming association - the National Federation of Unions of Agricultural Operators (FNSEA) – said in August that Russia’s ban could push Europe into a market crisis. The Netherlands, Germany, and Poland were Russia’s biggest food suppliers in the EU. The US shipped $1.6 billion worth of food to Russia in 2013. Prior to the sanctions Russia imported 36.7 percent of its meat, 32.6 percent of dairy, eggs, and honey, 30.4 percent of vegetables, and 24.2 percent of fruit from the EU, according to 2014 trade data. A new sanctions package was pushed by the West a few days after the Minsk agreement was signed on September 5, which included a ceasefire in eastern Ukraine. He recalled the public statement made by US Vice President Joe Biden that America’s leadership had to embarrass Europe to impose economic hits on Russia over the crisis in Ukraine – even though the EU was opposed to such a motion. “I don’t believe [the sanctions] help Europe,” Lavrov said.